Springfield Technical Community College announces the spring lineup for the Ovations Educational and Cultural Event Series. 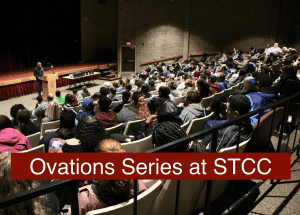 The Ovations Series is sponsored by The Chicopee Savings Bank Endowment for Academic Excellence, the Office of Academic Affairs and the Honors Program at STCC. The events are all free and open to the public. Professor and author Elizabeth Stodeur Pryor, Feb. 13, 10:10 a.m. and 11:15 a.m., in Scibelli Hall Theater: Stodeur Pryor is an associate professor of history at Smith College. She will discuss her article “Etymology of (the n-word): Resistance, Language, and the Politics of Freedom in the Antebellum North,” which won the Ralph D. Gray Prize for the best article of 2016 in the Journal of the Early Republic. Author/Illustrator and National Book Award Nominee Jarrett J. Krosoczk, March 28, 11 a.m., in Scibelli Hall Theater. Krosoczk, who was raised in Worcester, has published nearly 30 books and is a two-time winner of Children’s Choice Awards, Third to Fourth Grade. His graphic memoir, “Hey, Kiddo,” a recent nominee for the National Book Award, tells the story of growing up in an unusual household. Dorothy Jordan Pryor Award, April 3, 12:15 p.m., 7th Floor, Scibelli Hall: The Dorothy Jordan Pryor Award is given to an STCC member has had an impact on STCC and the community beyond. This year’s recipient, Ruth Butler, an instructor in the STCC Cosmetology Program, will accept the award on behalf of the entire program, which has lent its skills to numerous nonprofit events in the community.